At various modeling levels you can use information on physical domains, quantities and units. This information is stored in the file QuantitiesAndUnits.ini in the 20-sim bin directory. To edit this information you can use the Domains, Quantities and Units Editor. When opened, the editor automatically reads the file QuantitiesAndUnits.ini. When closed the editor asks you where to store the file. Note that any changes made become effective after 20-sim has been restarted. 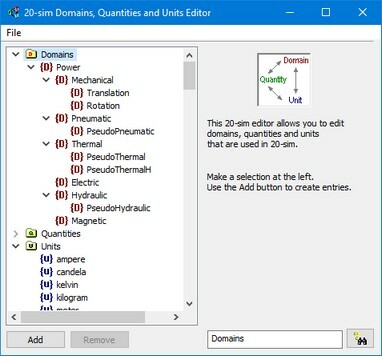 The Domains, Quantities and Units Editor. You can start the Domains, Quantities and Units Editor by selecting the Units Editor command from the Tools menu. In the editor a tree-like structure is shown indicating the available Domains, Quantities and Units. 1. You can select every items in the tree for editing. 2. Use the Add or Delete button to add new items or delete existing item. 3. Use the Find button to find items in the tree.